The Club owns a variety of sailboats suitable for the Great South Bay and different levels of sailing skills. Boats are available to members at no charge, providing there is no conflict with sailing lessons or other planned activities that require use of the boats. The Club’s first concern is in the physical safety of boaters at all times, so A minimum of sailing skill is required for a member to use a boat. Individual and group sailing lessons are available at a reasonable charge for both adults and children. Please speak to the instructors (who can be found either on the bay front or at the sailing shed) to arrange lessons or to request to take out a boat. All races start 1 pm. Skippers meeting at 12:30 pm. There are two Hobie Getaway sailboats in the fleet. Hobies are great for family fun on the bay. There are four Laser sailboats in the fleet. Lasers are designed for single handed operation for cruising and racing, by sailors weighing between 110 - 200 pounds. This photo is taken during a Sunday race. There are three Mercury sailboats in the fleet. Mercs are used for lessons from beginner to skipper class. There are five Opti sailboats in the fleet. Optis are used by 8 to 13 year old sailors from beginner to skipper level. There are four Sunfish sailboats in the fleet. 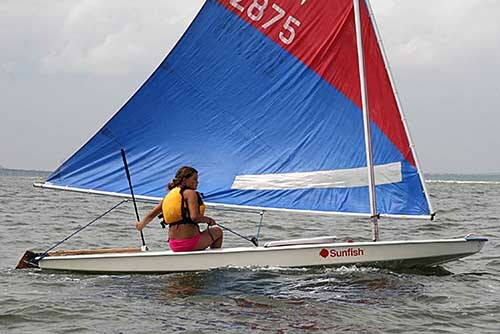 Sunfishes are an all around fun boat for all sailors. It is also used for racing. There is a beginner Paddle Board in the fleet. Here it is with Geoff on board. There are four windsurfers for various abilities in the fleet. Go Ralph!